That's right. An addiction to thrifting! I was in the SA this weekend and found some GREAT buys. I got this beautiful desk for my son. This is what it looks like inside. These pics were at the store so not the best lighting. I found these 2 pillow cases. The purple one is machine embroidered but the crocheted edging is gorgeous. The other one was hand embroidered! I hear you asking about the sewing machine right? Even has the original manual. The cabinet needs to be refinished but the machine is fabulous! The tension spring is good. The hand wheel moves up and down as does the needle. There is a bobbin case and the cords all look brand new! In the photo above you can see two silver buttons on the right on the base. Those drop the feed dogs! I can't wait to plug her in and see how she runs! My friend, Ellen and her husband dropped off her Treadle last week too. Shhhhhhh don't tell my husband. I have some finishes to share!!! Why do they always feel so few and far between? I made a basket for each of the women sharing the retreat with me. Interestingly enough the outer portion was all done from scraps! I have a ton of 2.5" squares already cut so the sewing went quickly. I used fabric from my stash for the handles and the lining and left over batting pieces. Once I figured out what I was doing they went together pretty quickly. It is, after all, a one hour basket. If you chose pretty outer fabric you could really get this done in an hour. 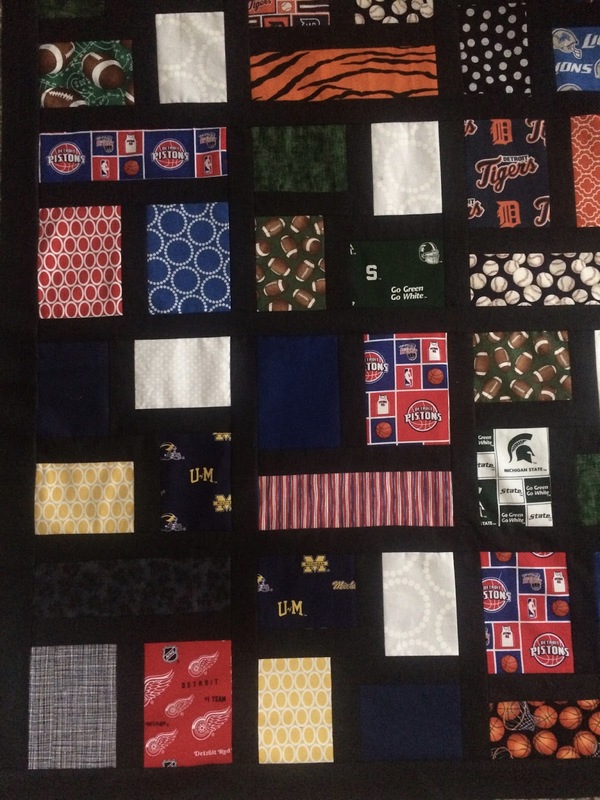 I will link up with Crazy Mom Quilts when her link opens. Most of the weekend was taken up getting my husband ready to leave for a week to Canada. He usually goes to his uncle's cabin several times each summer. Even satellite phones are bad up there. There is a LOT of cleaning up to do in the wake of his leaving. So after he was gone the cats thought I should be the new place to sleep. Little did I realize the vital service he was providing while he was home. I finished all the cutting for this beautiful star quilt (or at least the star parts). I still need to cut the sashing portion, and will begin that this week. There are 72 stars in all. e are using the fabric line Canyon by Kate Spain for the stars and the sashing. I think we will back it with the gray Free Fall line by Tula Pink. I sure do love using that line for my backs! 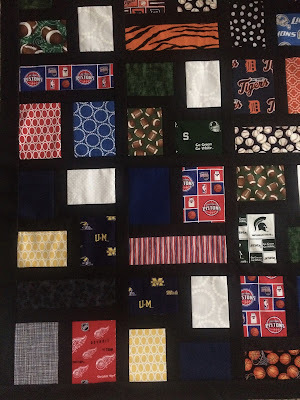 I just got 2 more quilts back from the quilter and need to get those bound. One needs to be mailed to the new owner and one is to be gifted on Saturday! All other progress on other quilts will have to stop while I get the binding finished. How is it that Wednesday comes so much faster than Friday each week? 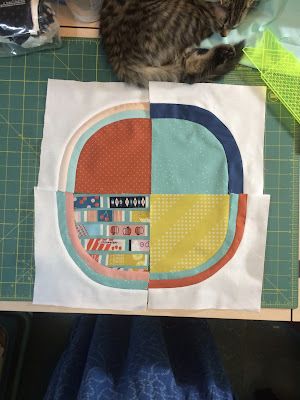 After the quilty retreat, I have not done much in the way of sewing. I had managed to get some border pieces sewn for Clove's pillow. I got stuck on the corners but looked it up on the internets (yes all of them) and found out what I needed to do to make the corners work. I still need to make some more strips and cut the rest of the blocks out, but I laid out what I did have finished and it should go together pretty easily. I may need to trim the center to make it fit, but there is plenty of room to do that. I realize the corner may not be right. I was in a hurry so will have to play with the layout but you get the idea. I think it will look pretty sweet once it is all sewn together. I have a sweet video to share of the kittens playing too. What have you been working on? Please link up. Still trying to get 15 or more link ups for a giveaway. I thought it might be time for some kitten updates. Cole is now 4 months old and growing like a weed. I believe he is going to be the sewing room cat. Although he may have to push Miss Hallie out of the way! He is super inquisitive and it is difficult to keep his little paws off the sewing machine! It is amazingly difficult to photograph an all black cat too btw. Once he finally settled in though he has the makings of a proper quilt inspector! Finn on the other hand has discovered his person in my husband. All previous cats have bonded pretty much to me but Finn LOVES Chris! He can't sit down without "his cat" snuggling up just like this. Finn is now 3 months old and still very food driven! Apparently this is the other position Finn likes to be in when Chris is in his chair. Every time Chris goes anywhere Finn follows him and cries until he picks him up! So cute! So there is your latest update on the kittens.